Not much specific to post….Andrew has his first runny nose in about five months. I think it’s due to being in Mother’s Morning Out after so long. He’s usually only around me all day and now he’s with five other children two days a week so I’m sure that’s made a difference. I hope it doesn’t get worse. Oh yeah, he’s got a new tooth on the bottom, bringing the count up to seven! Andrew is signing more words everyday. Everytime I try to list the words he knows I always leave out some words, but here’s a few off the top of my head that he signs on command; “thank you, hot, cookie, apple, hungry, eat, milk, bath, water, juice, Daddy, sleep, no, yes, hush” and many more! Well, I can’t believe it’s only 11:00 p.m. and Mitch is already in the bed. My mind is constantly running and I feel my TO DO list never gets shorter. Typing on the computer relaxes me so I don’t know if I’ll get back to that list before I lay my head on my pillow tonight. It’s probably not a big deal to anyone other than a parent or grandparent but I just wanted to share how proud I was of Andrew when he climbed high up the play equipment at Chick-Fil-A today and came down the enclosed slide all alone! I didn’t help him in anyway! 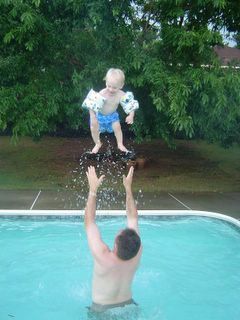 He was so excited about doing it that he got mad at me when I had to take him down so we could head home for his nap. I wish I had had my video camera with me. Luke has been kicking me alot more lately. Of course he chooses to do most of his kicking just as I’m getting into the bed for the evening. The only trouble I’m experiencing is difficulty getting comfortable throughout the night. I feel that I am up every hour either changing positions, moving pillows, or cooling off ’cause I’m so hot from the covers, pillows, and body heat from Mitch. The joys of pregnancy are grand!! Ok, how hot is it where you live? I can’t walk to my car from my front door without breaking a sweat. During lunch today I was watching ESPN (Mitch was eating lunch with me, hence the sports channel) and couldn’t believe that there were two high school football teams playing a game in 120 degree heat up in Birmingham (Hoover High vs. NEAS -St. Augustine, FL)! Tackling, running, passing, pushing, padding, arm wraps, socks, shoes, ….too icky sounding for me! The most outdoor time I got today was the two minutes it took me to check my mail. Wow, I think Andrew is upset with me. He tired easily & was frustrated about being placed in & out of his car seat (in the hot sun, mind you). He took a long two hour nap after Preschool & I then decided to take him to The Hollywood Connection, then to the hospital to visit a friend who just had her first child, onto the store to pick up a few items, and finally to a friend’s house to pick her up for dinner and to do some window shopping. Let’s just say that both baby and mom are ready for bed! Today was my first day teaching art at Westminster (www.wpcpca.com) to kindergarteners…let me just say that my 30 minutes with each class was hard work but it really flew by. Despite the fact that almost every student begged to work with paint, I managed to show them how much fun can be had with just a simple box of eight crayons. The magic moment for them came when they finished lunch and came out into the hall to find their “masterpieces” framed and displayed. Andrew is growing accustomed to his time in Preschool and seems to enjoy his playmates and teacher. It is always a joy to walk into his classroom and see him playing and smiling when I arrive to pick him up. Mitch gets to wake him up, feed him breakfast, dress him, and drop him off on these days since I have to be in my classroom early, so it gives Andrew good “Daddy time”. 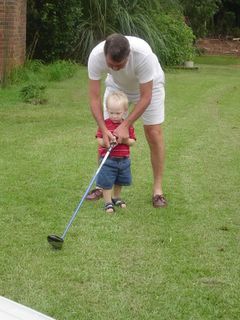 Pop shows Andrew how to hold a golf club. Andrew loves being in the water and he especially likes it when Daddy throws him up in the air!